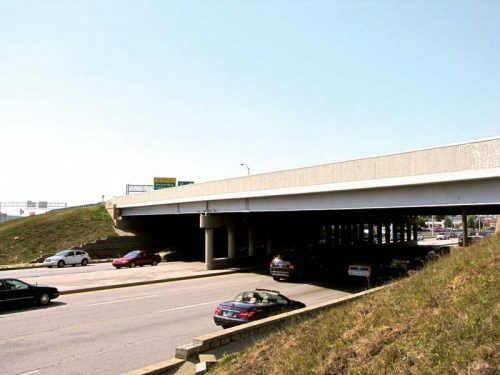 Hot-dip galvanizing (HDG) and zinc spray metallizing are often specified to protect bridges from the ravages of corrosion for their high recyclability, low environmental impact, and ability to offer long-term protection in harsh environments. To provide economic efficiencies and overcome the unique constraints of each application method, hot-dip galvanizing and zinc spray metallizing can be used in tandem on large or complex structures without sacrificing corrosion protection. To understand how HDG and metallizing come together to provide these benefits, the characteristics, costs, performance, and limitations of the two zinc coatings should be viewed separately. Batch hot-dip galvanizing, also commonly called ‘general’ or just ‘hot-dip’ galvanizing, produces a zinc coating by completely immersing the iron or steel product in a bath (kettle) of molten zinc. Prior to dipping the steel in the molten zinc bath, the steel is chemically cleaned to remove organic contaminants, mill scale, and oxides. The final cleaning step also leaves a protective layer of zinc chloride on the surface to prevent oxidation before immersion in the kettle. This layer will evaporate when the steel hits the surface of the molten zinc bath. The zinc bath consists of at least 98 per cent pure zinc heated to approximately 443 C (830 F). While the steel is in the galvanizing kettle, the zinc metallurgically reacts with the iron to form the hot-dip galvanized coating. This consists of a series of zinc-iron alloy layers and a surface layer of pure zinc. These intermetallic layers become tightly bonded (24,281 kPa [3600 psi]) to the steel, transforming into an integral part of the steel rather than just a surface coating. The zinc-iron alloy layers are harder than the base material, and provide excellent abrasion resistance. Another unique characteristic of batch hot-dip galvanized coatings is its uniform, complete coverage. During the diffusion reaction in the kettle, the intermetallic layers grow perpendicular to all surfaces, ensuring edges, corners, and threads have coating thicknesses equal to or greater than flat surfaces. Additionally, because hot-dip galvanizing is a total immersion process, all interior surfaces of hollow structures and difficult to access recesses of complex pieces are easily coated. While the steel articles are in the zinc bath, they float, move, and vibrate to ensure areas in contact with racks or wires are able to be coated. However, it is common to see strictly cosmetic ‘touch marks’ when the steel is withdrawn from the galvanizing kettle. These can be fixed up for esthetic purposes. These steel coils have been galvanized and rolled for easy storage inside this plant. International Organizations for Standardization (ISO) 1461, Hot-dip Galvanized Coatings on Fabricated Iron and Steel Articles—Specifications and Test Methods. They contain minimum coating thickness requirements based on steel type and thickness. The hot-dip galvanized coating is thicker and/or denser than other zinc coatings. 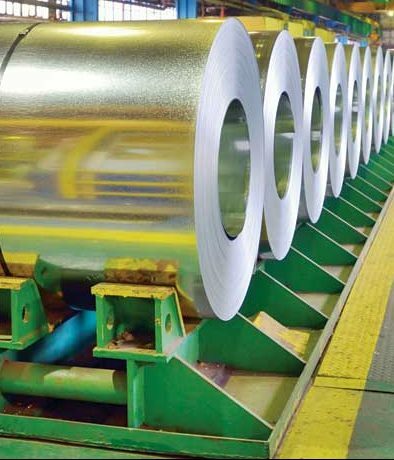 The time-to-first-maintenance (TFM) chart shows the linear relationship between hot-dip galvanized coating thickness and maintenance-free service life in atmospheric exposure. For example, ASTM A123 requires structural steel 15 mm (5⁄8 in.) thick or greater to have a minimum coating thickness of 0.1 mm (3.9 mils), which in an industrial environment would provide a time to first maintenance of 72 years. Hot-dip galvanizing is a complete immersion process, which means the parts must fit in the zinc bath to be coated. Size can be a limitation when hot-dip galvanizing large structures such as bridge components. However, the average kettle length in North America is 12 m (40 ft), and 16 to 18-m (55 to 60-ft) kettles are common. If an item is too large for total immersion in the kettle, progressive dipping can be utilized to immerse each end of the article sequentially to coat the entire item. In other words, if half of the piece can fit in the bath, the part can be galvanized on one side, rehung, and then dipped on the remaining surface. In essence, this would nearly double the size of the part that can be coated. Progressively dipped pieces often have an overlap area visible on the piece. The line or darker area is purely cosmetic, and will fade over time as the coating naturally weathers. However, the overlap area will most likely have a thicker coating, so it is important to consider this if the area will be an important connection point with other pieces.